The knitting pattern for the Lace Stripes Square combines rows of lacy eyelets with garter and stockinette rows for a beautiful texture. Without changing colors, you can create a striped effect through the changes in stitch patterns. This pattern is the twenty-fifth square in the Harmony Blanket Knit Along. As my longtime readers know, I am a collector of stitch pattern books. 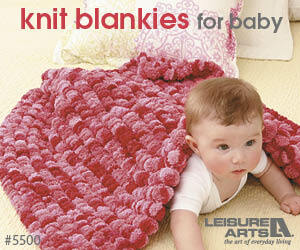 If you’re participating in the Harmony Blanket Knit Along, I’m guessing you love learning new stitch patterns, too. For each of the 10 patterns I’m designing in the Harmony Blanket KAL, I’ll be highlighting the book where I came across the stitch pattern. 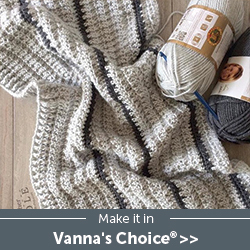 This pattern is based on “Lacy Stripes” from 200 Stitch Patterns for Baby Blankets: Knitted and Crocheted Designs, Blocks and Trims for Crib Covers, Shawls and Afghans by Jan Eaton. You can find my complete book review here and, if you’re reading this on or before July 2, 2018, you can also enter for your chance to win a copy! If you make your own Lace Stripes Square, I’d love to see it! Share your progress and questions by tagging me on Facebook as @Underground Crafter, Instragram as @ucrafter, or Twitter as @ucrafter. You can also share a picture in the Underground Crafters Facebook group. 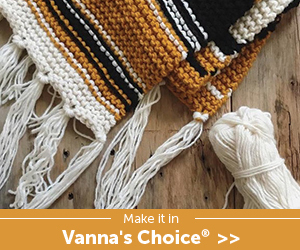 Sign up for my weekly newsletter and get a coupon code for your choice of one of my premium patterns and other subscriber goodies. Plus, you’ll never miss one of my free patterns again! Add the Lace Stripes Square to your Ravelry favorites or queue. Alternate rows of lacy eyelets with garter and stockinette rows for a beautiful texture and the effect of stripes. Lion Brand Vanna’s Choice yarn (100% acrylic, 3.5 oz/100 g/170 yd/156 m) – 1 skein in 158 Mustard, or approximately 42 yd (38.5 m) in any medium weight yarn. p2tog – purl 2 stitches together – A Lion Brand video tutorial for this stitch is available here. yo – yarn over – A Lion Brand video tutorial for this stitch is available here. Pattern repeat is any multiple of 2 sts, + 1 st for edging, + 8 sts for borders. Row 2: Sl 1, k4, *p2tog, yo; rep from * across to last 6 sts, p1, k4, p1. Rows 3-5: Rep Row 1, 3 times. Row 6: Sl 1, k3, p to last 4 sts, k3, p1. Rows 7-8: Rep Row 1 twice. Rep Rows 1-8 until square measures approximately 5.5″ (14 cm), ending after Row 3. © 2018 by Marie Segares (Underground Crafter). This pattern is for personal use only. You may use the pattern to make unlimited items for yourself, for charity, or to give as gifts. You may sell items you personally make by hand from this pattern. Do not violate Marie’s copyright by distributing this pattern or the photos in any form, including but not limited to scanning, photocopying, emailing, or posting on a website or internet discussion group. If you want to share the pattern, point your friends to this link: https://undergroundcrafter.com/blog/2018/06/21/knitting-pattern-lace-stripes-square. Thanks for supporting indie designers! The knitting pattern for the Hurdle Stitch Square combines a 1 x 1 ribbing pattern with garter stitch rows to create a boxy look and a fun texture. The stitch pattern is easy to remember, so it’s a great square for knitting newbies or for tv knitting for more advanced knitters. This pattern is the fifth square in the Harmony Blanket Knit Along. For each of the patterns I’m designing in the Harmony Blanket KAL, I’ll be highlighting the book where I came across the stitch pattern. This pattern is from the Complete Photo Guide to Knitting by Margaret Hubert. You can find my complete review of the first edition of this book, along with an interview with Margaret Hubert, here. (Spoiler alert: It’s also on my list of Must-Have Beginner Knitting Books!) Since my first review, the book has been updated to include even more stitch patterns and projects. If you make your own Hurdle Stitch Square, I’d love to see it! Share your progress and questions by tagging me on Facebook as @Underground Crafter, Instragram as @ucrafter, or Twitter as @ucrafter. You can also share a picture in the Underground Crafters Facebook group. Sign up for my weekly newsletter and get a coupon code for your choice of one of my premium patterns and other subscriber goodies. Plus, you’ll never miss one of my free patterns again! Add the Hurdle Stitch Square to your Ravelry favorites or queue. This textured stitch pattern combines 1 x 1 ribbing with the garter stitch. Lion Brand Vanna’s Choice yarn (100% acrylic, 3.5 oz/100 g/170 yd/156 m) – 1 skein in 158 Mustard, or approximately 38 yd (35 m) in any medium weight yarn. Pattern repeat is any odd number of sts, + 8 sts for borders. Row 1: (RS) Sl 1, k5, *p1, k1; rep from * across to last 5 sts, k4, p1. Row 2: Sl 1, k4, *p1, k1; rep from * across to last 4 sts, k3, p1. Rows 3-4: Rep Border Row 2 twice. Rep Rows 1-4 until square measures approximately 5.5″ (14 cm), ending after Row 2. © 2018 by Marie Segares (Underground Crafter). This pattern is for personal use only. You may use the pattern to make unlimited items for yourself, for charity, or to give as gifts. You may sell items you personally make by hand from this pattern. Do not violate Marie’s copyright by distributing this pattern or the photos in any form, including but not limited to scanning, photocopying, emailing, or posting on a website or internet discussion group. If you want to share the pattern, point your friends to this link: http://undergroundcrafter.com/blog/2018/02/01/knitting-pattern-hurdle-stitch-square. Thanks for supporting indie designers!